When Janesville native Louis Wayne Tyler was drafted into the U.S. Army during World War II, he probably imagined eventually being deployed to the European or Pacific Theaters. He might have considered the possibility of going to North Africa or the China-Burma-India Theater. He may have even heard stories of other Wisconsin men and women serving in places like the Aleutian Islands and the Persian Gulf. But in all likelihood, he never would have guessed his two major duty stations: Panama and Brazil. Tyler, who went by his middle name Wayne, had a master’s degree in English from the University of Wisconsin-Madison and was teaching at the University of Maryland when he entered the Army. 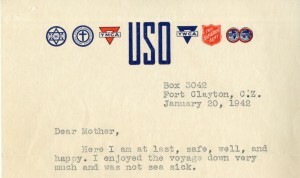 His collection at the Wisconsin Veterans Museum includes dozens of highly articulate letters written to his mother that contain the impressions of a young Wisconsin man on the food, scenery, and local culture in these two unusual World War II outposts. The United States placed great importance on protecting the Panama Canal during World War II, sending thousands of troops to the Central American country to defend it. 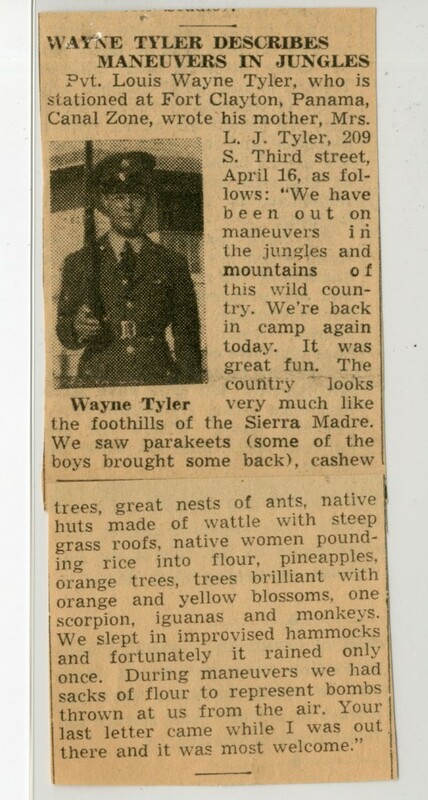 Tyler, who trained at Camp Wolters, Texas, arrived in country in late January 1942 and served there for over three years, first at Fort Clayton near the city of Balboa with Headquarters Company, 150th Infantry Regiment and later at Fort Kobbe near the canal with the 83rd Coastal Artillery. 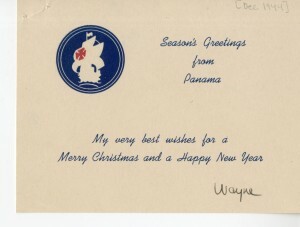 His letters from Panama described the exotic local flora—“The poinsettias are in bloom and are very beautiful. There are gladioli in bloom and fine red lilies. There is a kind of wild gardenia, very small and white, but without any scent.”—and fauna—“Iguanas are the most repulsive looking animals imaginable, all scales, with a long powerful tail. Imagine a medieval dragon reduced to from two to three feet in length and you have an iguana.” Tyler also quickly connected with J.C. Ward, a former colleague at Maryland who was teaching at the local university in Balboa, and Ward helped explain local culture and customs that Tyler related in the letters to his mother. Tyler left Panama to attend courses at the Adjutant General’s School at Camp Lee, Virginia in the summer of 1945. Soon after, he received an assignment to the Joint Brazil United States Military Commission in Rio de Janeiro in August and he remained there through December. The Commission sought to strengthen the bonds between the two nations and improve the defense capabilities of Brazil. Living in a small apartment two blocks from Copacabana beach, Tyler wrote to his mother describing the fantastic food (steaks, avocados, and strawberries & cream), the rich culture, and the incredible architecture and style of the city. He also observed a national election and commented on methods of campaigning: “Sometime during the night the parties paint signs everywhere and change each other’s signs. If someone writes VOTE DUTRA on a wall, someone else adds NAO in front of it.” Days later, he wrote his mother that he received orders to remain in his apartment for several days. He learned that it was due to a military coup that removed President Getulio Vargas from power and paved the way for the election of Eurico Gaspar Dutra. Tyler returned to the United States at the end of 1945 and was honorably discharged on March 7, 1946. He used the GI Bill to receive his doctorate in English from the University of Wisconsin-Madison, and after a brief stint at the University of Akron he joined the faculty at the University of Wisconsin-River Falls. He taught English there for twenty years and upon his retirement was granted emeritus status. He passed away on September 9, 1995. The story of his service in a war that was truly global lives on at the Wisconsin Veterans Museum. Interested in more of these stories? “World War WHERE?” is featured in the Fall 2014 edition of The Bugle, the quarterly newsletter from the Wisconsin Veterans Museum and an exclusive benefit of WVM membership. Learn more at http://bit.ly/1sS8d9U.